A Montreal comedian spoke to U.S. Republican vice-presidential candidate Sarah Palin on Saturday by impersonating French President Nicolas Sarkozy. 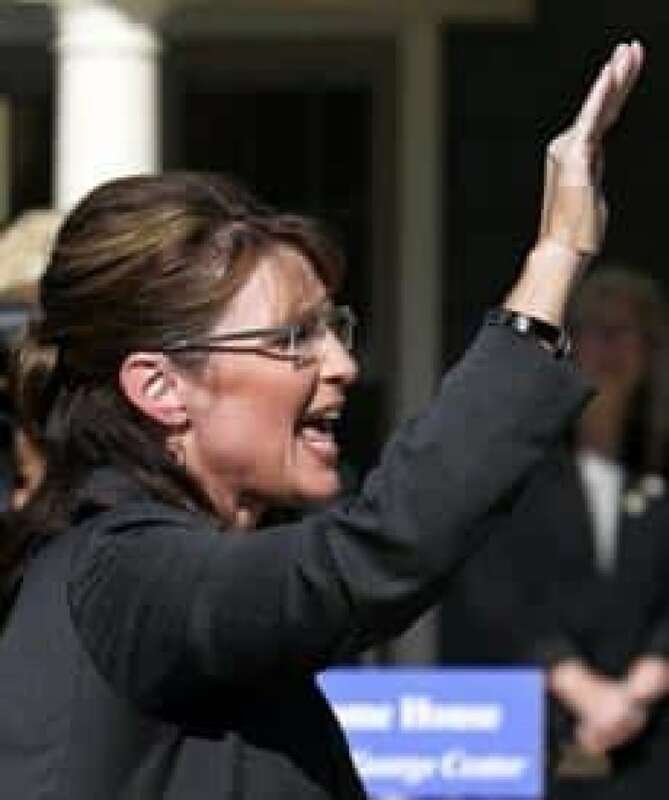 Vice-presidential candidate Sarah Palin, seen here at a rally in October, thought she had received a phone call from French President Nicolas Sarkozy. ((Tony Dejak/Associated Press))A Montreal comedian spoke to U.S. Republican vice-presidential candidate Sarah Palin on Saturday by impersonating French President Nicolas Sarkozy. Marc-Antoine Audette, who called from radio station CKOI, chatted to Palin about hunting, relationships, family and politics before revealing it was a prank call, according to a transcript published by the Canadian Press. Palin officials issued a statement Saturday, saying she was "mildly amused to learn that she had joined the ranks of heads of state, including President Sarkozy, and other celebrities in being targeted by these pranksters." Audette, who is part of the comedy duo known as the Masked Avengers, got through to Palin's campaign after days of trying, and once she's on the line, eggs her on: "You see, I [Sarkozy] got elected in France because I'm real and you seem to be someone who's real, as well." Palin replies, "Yes, yeah. Nico, we so appreciate this opportunity." As Sarkozy, Audette tells Palin, the governor of Alaska and a moose hunter, that he loves hunting and they should go together. She responds that "I think we could have a lot of fun together while we're getting work done. We can kill two birds with one stone that way." Audette speaks French at several points, which Palin doesn't understand, and uses fake names for Canadian politicians, which she doesn't catch. He identified the Canadian prime minister as "Stef Carse" (a singer) and said that the prime minister of Quebec, "Mr. Richard Z. Sirois," (a Quebec radio host) is a good friend. He also made a comment about how good Sarkozy's wife, supermodel Carla Bruni-Sarkozy, was in bed, and asked Palin whether she knew about the pornographic spoof video called Nailin' Paylin. "Ohh, good, thank you, yes," she replies, according to the transcript.. The conversation lasted six minutes before Audette told Palin she had been the victim of a spoof. He told the Canadian Press the interview was the Masked Avenger's biggest triumph, in a list that includes Stones singer Mick Jagger, pop star Britney Spears, Microsoft co-founder Bill Gates and Sarkozy — by impersonating Prime Minister Stephen Harper. The Avengers — Audette and Sebastien Trudel — have a regular show on CKOI, and plan to air the interview before the the U.S. election on Nov. 4.